Mesnes Park last week on a warm day. Nice day, but SNAP from June 20th. Knew it wouldn't be long before the kids were dangling their feet in to beat the hot weather.....lovely pic Thomas.....cheers!!! will give it 6months before it is wrecked. When we walked past it was full of teenagers climbing all over it. nice to see children still do roly polys down that grass bank! Yep, just read that the bandstand and the gate house have been vandalised already. No doubt the response from MONEY FOR YOUTH(whoever she is??? some mamby pamby, liberal no doubt) will have the excuse that they are bored!!!! !and the money spent on refurbishing these buildings should have been spent on the "LITTLE DEARS" instead of this rubbish... Should have CCTV surveillance and anyone found vandalising, should be publicly shamed and made to pay any repair costs. NONE of this "To Young" If they are old enough to go into the park unsupervised they are old enough to know right from wrong. Some time ago, here where I live a pre-school play area was vandalised. Eventually teenagers were found to be responsible. They were able to choose their punishment. Get a criminal conviction or repair the damage & publicly apologise to those concerned, they chose the second option. Hopefully they will have learnt something about living in a society where their destructive behaviour will not be tolerated. PS. I should have also said I think the photo is a nice summery one Thomas, with 'children' doing what they have always done & will always do when there's a drop of water about ! A few years ago some teenagers were caught damaging the Botanical gardens here in Bath. For their punishment they were made to work in the gardens for a few months. They liked it so much, they asked if they could be trained to continue doing the work. Penalty for Grafitti or vandalsism in Singapore PUBLIC FLOGGING...A bit extreme but it works! they still have a sense of shame. Happen it's the same' Mamby Pamby's' that wanted the Boy's and Girl's Club to be built on The Mesnes, didn't they realise or even care that this club would attract 'riff raff' from all over; hence the sudden increase in town centre vandalism, and with this hot weather continuing expect a lot more vandalism in the park. Cyril if you locals used the park there would be no vandalism. Whilst I agree, basically, with WIGANER, why does He/She assume that MONEY FOR YOUTH is of the female gender? I don't think that "bleeding heart liberalism" is restricted to women only!! I got a little carried away there, but nice picture, Thomas; it's good to see children being children and doing the natural thing children do on a hot sunny day! Liked the comment from Maggie - a positive outcome, oh if only that could happen here!! Should try it though, one never knows. Mick. 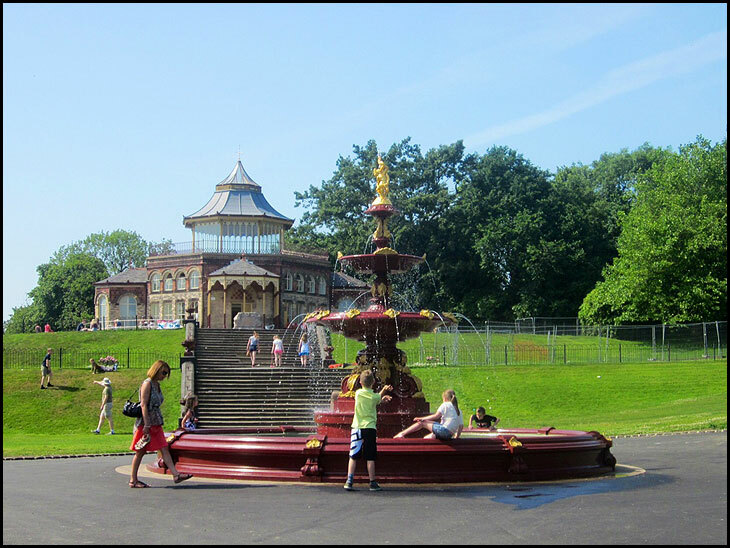 the windows were smashed in the gate house and tiles broken on the bandstand roof over the weekend. If the windows have been smashed in the gate house..which I believe has just been renovated & tiles broken on the the bandstand roof. I think it is up to you Wiganer's to press for some action. Don't tolerate hooligans. Folks can't be in the park 24/7 Mick, especially in the late evenings when the vandalism takes place by feral youths. When the college was in the old Pagefield Mill building there were attacks on students going between campuses at dusk, they asked the council to install lighting to make it safer but, the council as is their usual excuse said they hadn't the money, and that lighting was unnecessary. So you see that neither the council nor the police gives a scorrock as to what goes on in Mesnes or any other Park at night, and yet if someone did give them a clip around the ear the area would be swarming with police searching for the perpetrator. previous comment should read 20/7 not 21st I think.